Esta aventura épica incluye tres de nuestros principales tours: un tour de cuatro horas por la ciudad de Dubai, un safari por el desierto con cena y danza del vientre y un crucero por la noche en un dhow tradicional. Personalice su recorrido para satisfacer sus necesidades y programe al llegar a todos los puntos calientes en un solo día, o repartirlos en dos o tres tardes. Elija lo que elija, esta opción económica es una manera perfecta de ver los sitios. Crucero en un dhow tradicional. Relájate en un safari por el desierto épico. Ver danza del vientre y baile local de Tanoura en vivo. Ahorre dinero reservando estos tres populares tours de Dubai juntos, luego elija una hora que se ajuste a su horario. Die Touren waren wirklich gut, nur schade dass diese in Englisch stattfanden, was auf der Homepage nicht klar zu ersehen war. Am Besten war die Wüstensafari. No one came to pick me up Dhow dinner Cruise pick up. I was in the same locations as I was for the city tour and Desert Safari. The other two events were fulfilled as booked. There appears to be no number to call and and get this straightened out either. The city tour was very interesting and we had a super clued-up guide. Desert safari an unforgettable experience, once again with excellent tour guides and drivers. The dhow cruise was a most unexpected, weird experience! The sightseeing trip guide Malik was excellent. We also enjoyed the desert safari and dhow cruise dinner trip. The trips pick up times were all confirmed the day before and the drivers arrived on time. This was a first trip to Dubai. Ökensafarit var en häftig upplevelse, dessutom hade vi tur med en superhärlig chaufför. Stadsrundturen var också bra. Dhow-middagskryssnignen hade vi kunnat vara utan, okej mat men underhållningen alltså, sjukt märklig uppevelse. Prisen taget i betragtning var turene ok. Der manglede dog kommunikation, guiderne og chaufførerne var meget lidt talende. Dinnercruiset blev forsinket og dermed afkortet med over 30 minutter, grundet venten på forsinkede gæster ligesom maden på skibet ikke var af særlig høj kvalitet. Guiden på busturen var den bedste, de andre kunne ligeså godt have været taxachauffører. This was a fantastic tour package. It had 3 portions the city tour and the dinner cruise on 1 day and the desert safari on the 2nd day. 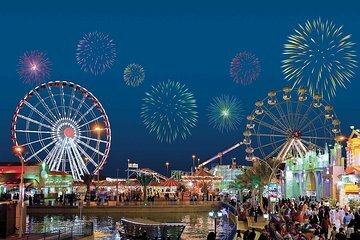 It truly gives you a quick experience of Dubai for a very fair price. My tour guides were knowledgeable and friendly and made the experience that much more enjoyable. I would recommend it to anyone visiting Dubai. Thank you for a wonderful trip. the tour guide didn't speak English so it wasn't much of a tour. spent most of the time sleeping in the car and then when we got to the Dubai museum he had the cheek to ask me to pay! when the entrance fee of the museum was included in my package!